Student burnout, school anxiety, and focus on performance are themes I’ve been hearing families struggle with lately. School can be highly competitive for some students. Early on, we encourage pursuit of prestigious academic accolades, awards, and top scores. But research points to social connection as one of the most valuable factors that can predict success for students. We tend to value the brightest star in the sky, rather than a sky full of bright stars, and the effects may be spilling out onto your dining room table at homework time. If homework time in your house is plagued with procrastinating, frustration, distraction or maybe even explosions, it’s a good time to think about trying some new strategies. Success for your child requires important skills related to comprehension of time, complex planning, and self-regulation. Try incorporating the following strategies to support a balanced and connected approach to learning and success. Similarly, children are taught early on that it’s necessary to compete in order to stand out. Kids study individually for school so they have a chance to outperform their classmates. Students are spending increasing amounts of time on homework every night, often at the expense of social connection, sleep, and health. But research now shows us that shifting the focus away from individual achievement and refocusing on a more collaborative model for learning and achieving can dramatically improve performance, reduce anxiety and increase happiness. Encourage your child to gather a group of friends or classmates and take turns hosting with other parents. Get to know the strengths and contributions of each child. Teach and model the profound benefits of praise for your child. Point out how each child’s contributions are significant, unique, and crucial to the success of the group. Encourage group members with stronger skills to help struggling members, while also praising the strengths of the child receiving support. What is your role during homework time? Are you the timekeeper? Do you give periodic reminders? Do you nag? Have you put yourself in charge of signing in to your child’s online classroom management site daily to look for missing assignments and grades? If you’re seeing a consistent struggle related to homework, there’s a good chance doing things a different way could be key. Now is a good time to work along with your child if you want to see her become more independent down the line. A child’s capacity to see into the future is limited, and is often—unfortunately—dependent on reminders and directions when it’s time to get things done. Developmentally, a child will move toward independence when she can visualize the end point, or what it will look like when complete. Simply put, your child needs to learn to create and execute her own realistic mental plan for how she will spend her time. You can make an enormous positive impact by serving as her coach. But be careful, your job description is specific. · Replace ‘checking’ your child’s planner with completing and reviewing the planner together. Have a conversation about completing the planner daily, and whether the day played out the way it was anticipated. If your child has a hard time writing in her planner, it’s ok to write for her. · Don’t ask your child if homework has been completed. Sit next to your child, and have her walk you through each class as she visualizes any open assignments and progress she’s made. Help by doing any necessary recording or updating in her planner as she talks. Afterwards, show her the corrections and additions you made in the planner and discuss a new plan of action. · Use “If…Then…” questions and statements when discussing homework and making plans with your child. This ‘stretches’ what we call the temporal spatial window, and in turn helps a child see and plan further into the future. For example, you may say to your child as you are looking at her planner together, reviewing her homework plan for the upcoming evening, “It looks like you may be pressed for time tonight. If you start to run out of time after your history homework, but before study time for your Spanish test, how do you see yourself rearranging your plan? (I recommend using the 360 Thinking Academic Planner to promote executive function, available in our office for purchase or at http://efpractice.com/shop/2016-2017-academic-planner). 3. Replace telling time with showing it. You may notice that for some kids, admonishment of time limits and targets (such as having 5 more minutes to play or wanting to have a chore completed within 15 minutes) can help with staying on task or making a smooth transition. For others, however, such warnings only increase stress and anxiety. Using time keeping tools like a glass face analog clock can work wonders for kids who really have not internalized the feeling of time or are developmentally behind in time awareness and management. · Have analog clocks around your home so that your child can better visualize parts of a whole hour. The ability to see and sense the passage of time will help your child to better manage herself within given periods of it. The 360 Thinking model and program for executive function suggests using ‘working clocks’ at your child’s homework station. This clock will serve as a visual time blocker as your child blocks off chunks of time with a dry erase marker prior to completing tasks. A clock with a glass face can be easily written on with dry erase markers and wiped clean. · Do not set timers for your child. Rather, have your child shade in a portion of the analog clock depicting the anticipated length of time for completion of homework for each subject. Sometimes, the simple act of drawing time on the clock is enough to give kids the push they need to gain or maintain focus. I don’t hear many families in my office talking about how much they love homework time. Though after adopting some of these tweaks and hacks, I definitely hear families talking about homework being less of a problem. 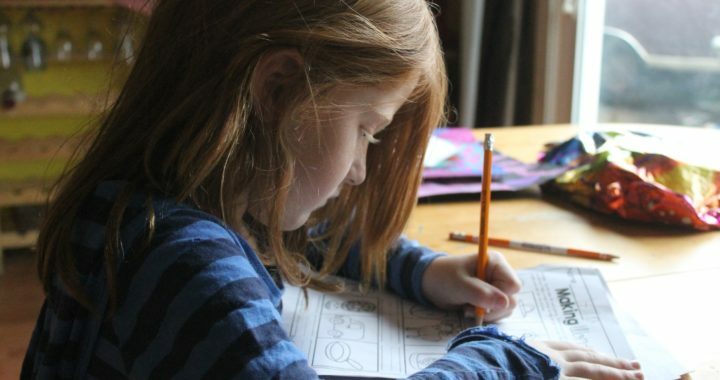 As your child begins to gain strength in reasoning, logical thinking, and ‘frontal lobe’ function (executive function), homework time should become much easier. Even better, these skills are transferable across settings, so you may notice your child improving in other areas, as well. Don’t forget to encourage your child to have fun while learning, and to build those social connections. If there are more bright stars in the sky, the sky will shine brighter. Posted in Articles, School and Homework.